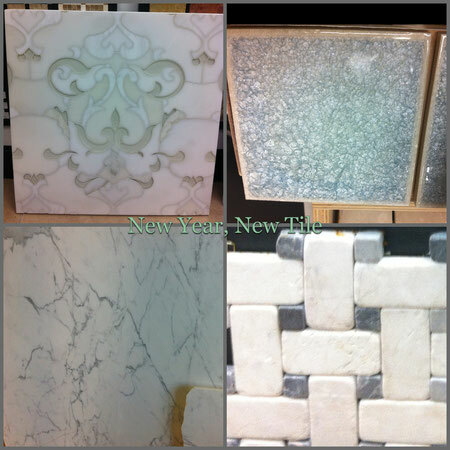 New Year, New Tile! - Website of seatondelongdesigns! We have been working on a lot of bathrooms recently. So we have spent a fair amount of time in tile showrooms, slab yards, and plumbing and fixture stores. We are fans of classic elements: basket weave in stone, neutral colored marble (grey is a neutral). But the new accent items are like the jewelry for your bathroom. The latest waterjet cutting can make intricate designs with stone, tile, and glass. These custom pieces are like works of art. And our other new favorite is the shattered glass tiles, the way they catch the light is pure beauty. Time to relax in your own private spa! Ahhh, Happy New Year indeed. I love the tile above! Your site is a wonderful resource. Great ideas and design direction. Thanks for posting a refreshing take on modern design. I was glad to discover this site. I have to thank you for your minute because of this fantastic read!! I certainly appreciated all of it and I have you book-set apart to see new things in your site.